Also, been working on my dad's 75th birthday party surprise (not a surprise party, he knows about it) and party planning. 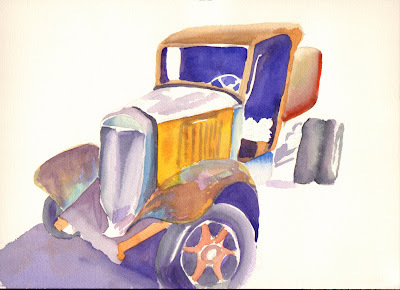 I do make time for my Tuesday night watercolor class. 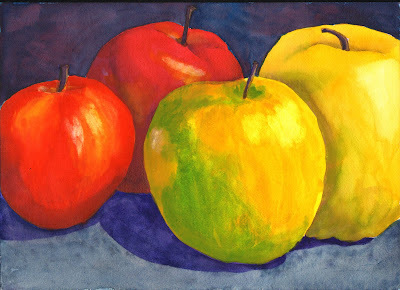 Last week we painted apples. This week was free choice of subject, so I brought in a photo I took of an old farm truck located at La Verne Heritage Park. This is a work in progress and I will post a picture when it is finished. My baby girl (as I will always refer to her) is with her partner, Grant, in Australia at the moment. They flew to Brisbane yesterday for 10 days of vacation, staying with Grant's mum (not mom over there). They plan to go camping right away, probably already camping as I write this. I can't wait to hear about their adventures when they return.